For Whom The Who Tolls. An animated feature that kids will enjoy and adults will find tiresome, HORTON HEARS A WHO! is a Dr. Seuss tale about Horton the elephant in the jungle of Nool, discovering a microscopic city called Whoville on a speck of dust, and vowing to the microscopic mayor to transport the speck to a safe place in the jungle. HORTON lacks the charm of WALL-E, the verve of SURF’S UP and the bravado of CORALINE. 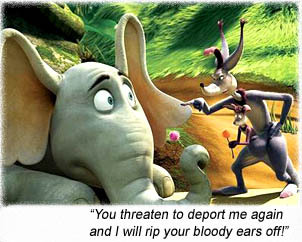 But it does have Jim Carrey (voicing Horton) and Steve Carell (voicing the Mayor). The nominal villain is Kangaroo (Carol Burnett), who riles Horton on his “imaginary city,” maintaining he’s a bad influence on the youth, employing a vulture (Will Arnett) to destroy the speck of dust, while campaigning against Horton with rousing, fact-free speeches to mobs of apes (like Sarah Palin at any given Republican rally). Visualization of Dr. Seuss’s graphics is astounding; eye-popping colors swirl and mash your brain, and there is a short cartoon segment that emulates his drawings exactly. There’s also a crazy yellow thing called Katie that should make dumb kids laugh and give smart kids nightmares. Seth Rogen voices Morton, a blue mouse-thing, Dan Fogler is a Who Councilman and Isla Fisher is Dr. Mary Lou Larue, who hits on the film’s best concept – the plurality of worlds, and how every speck of dust is a world unto itself. HORTON is one of those animated features (like CHICKEN LITTLE, SHREK) that squeezes in a completely irrelevant popular song for its closing number, for all the characters to perform in wondrous joyousness that makes our flesh crawl. HORTON ends gratuitously with REO Speedwagon’s Can’t Fight This Feeling. If you’re going to squash a square song into a round movie, I’d rather hear a Who – the real The Who. Director: Jimmy Hayward, Steve Martino. Starring: Jim Carrey, Steve Carell, Carol Burnett, Will Arnett, Seth Rogen, Jonah Hill, Isla Fisher, Dan Fogler, Amy Poehler, Jaime Pressly, Charles Osgood.